Claire Pestaille lives and works in London when she is not out and about exhibiting internationally. Her art is increasingly being recognised and acquired by important collectors. In 2000 she graduated with a Master’s degree from Royal College of Art. In addition she has once served as studio assistant for Chris Ofili and acted as a visiting lecturer at Sunderland University and Chelsea College of Art and Design. 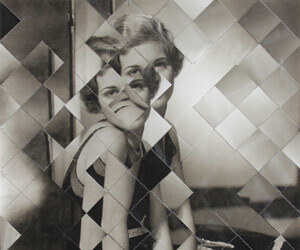 Contemporary and vintage photography form the source material for her collages and paintings. 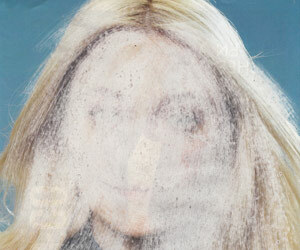 The artist slices and dices film stills and past celebrity photographs into something remarkable. 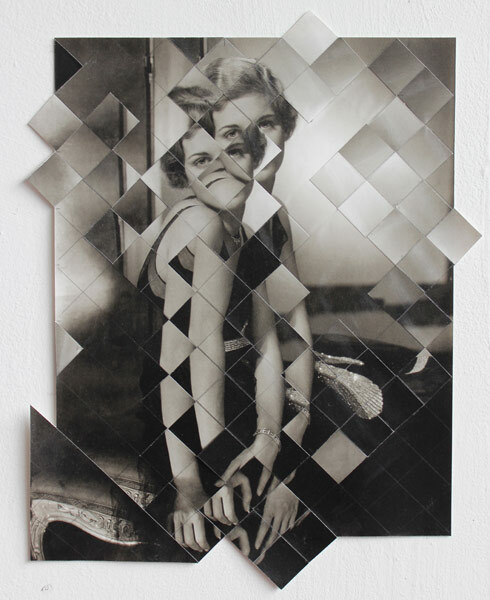 Whenever a fine artist creates collages, there will always be a witty observer audacious enough to say: “so you cut these things up and then you stick them all back together again?” But therein lies the magic, and the inescapable emotional connection with us. It is a full on assault. 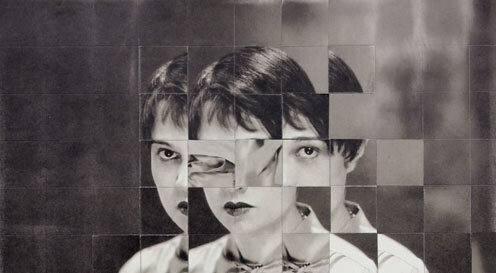 Photographs are duplicated, cut up, divided and re-assembled like a jigsaw puzzle allowing the artist to intervene with the authority of the original and produce new meanings. The act of creating new meaning is potent stuff that also happens by chance in palimpsest or in music when two or more voices meet in a contrapuntal fugue. The real art, however, is to identify it and to harness its power. 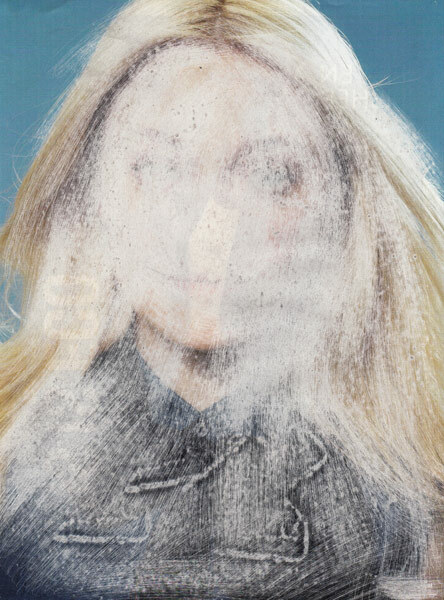 By using multiple copies of the same source photo, Pestaille produces multifaceted representations of women, which are sometimes also multi-eyed. Whenever that happens we are receiving more inquisitive gazes from the art looking out at us than the art receives from us looking in. It is a fact of math — as multiplied by the direct stare of Lord Kitchener’s ‘Britons want you’ except for that impressive moustache. 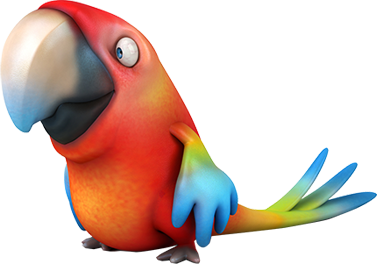 Speaking of which, there are men featured in her work and on rare occasion also a bird. But the art always refers to women and femininity. A safe and lazy bet would be to say that the work is autobiographical because so little art or literature can avoid that altogether. Alternatively, someone would say it is the perception of one’s self as a woman and part of a hostile fragmented reality or some post-modern simulacrum. However both explanations would bark up the wrong tree, because they would suggest introspection only, and a fair number of artists already do that ad nauseam. Pestaille’s focus is rather outside herself and in dialogue with us. Her art is her way of drawing our attention to – if not to undermine – our ready acceptance of the way that the media portray women. What Claire Pestaille has cleverly done is to insert the correct number of speed bumps on the lanes of our fast and furious image consumption. We cannot but stop and dwell on her intentions let alone the intentions of the originating image makers whose work the artist is so cunningly messing up. Those are the words on Claire’s own website, and as an exploration it is one that someone must explore. You might be fooled into believing it is all old hat; a well trotted path, and the calling of 60s Amazons burning their bras. But it is a vast territory demanding different voices. A recent line of Pestaille’s enquiry did not involve scissors or scalpels as much as it involved sanding off parts of perfectly retouched women who were featured in full-page magazine adverts. They are – or rather were – powerful images in their own right featuring either a top model or a celebrity endorsing a luxury brand. A retouching agency had sand blasted them into perfection in Photoshop before they went to print, and it removed blemishes, wrinkles, warts and all. The sand blasting job Pestaille has then chosen to continue to the extent that the individual is being removed, and we are left with an object only. It appears to have taken surprisingly little extra sanding to remove the individual. A fact that makes this art a stroke of genius in exposing what is going on around us. The series of work consists of pieces named ‘citizen’ and a number further anonymising the sitters concerned. In all this you cannot help but detect an undercurrent of mild sarcasm directed at the media, whose representatives argue that they simply dish up what we ask for. Either way, the work reveals the propensity of confining women to the prevailing norms and expectations of society at the moment the photographs were taken. That for instance could be the near slavery to youthful beauty — a type of attraction we all know conforms to the law of diminishing returns. It builds women and their power up followed by tearing it all down again. It conveniently feeds our hunger for novelty. It paves the way for a new generation of women who may or may not have any substance to offer, but are blessed with that elusive thing called beauty. 2008: Promenades Insomniaques, Sleeping/dreaming in contemporary art, curated by Marie Shek, Passage de Retx, Paris. 2005: Hand in hand we walk alone, Clapham art gallery, London.